Following an extensive refurbishment, the Red Lion pub in Stoke Poges re-opened to the public last weekend. 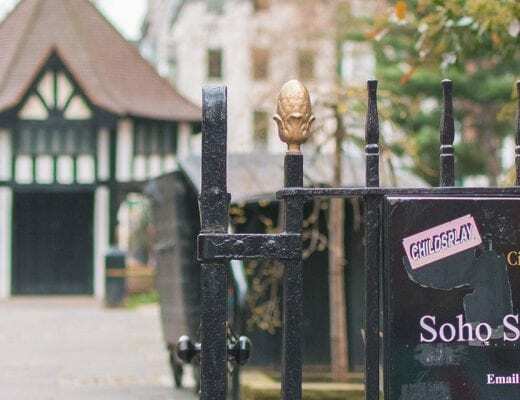 Long gone is the plain decor of a typical British pub, and in its place is a welcoming gastro pub with delicious food and drink that is bound to leave you wanting more. In this post, I give my full and honest review of the menu, furnishings and service I experienced during the Red Lion’s press preview last week. Stoke Poges in Buckinghamshire is a quaint little village, just north of Slough. It’s the kind of place you’d expect to find a premium pub and, following its refurbishment, The Red Lion certainly fits the bill. Upon arrival, one of the managers welcomed us with a beaming smile and explained how sorely needed the refurbishment was. Though we had never visited the pub before, a quick Google of the pub’s old decor meant we fully agreed. The bog-standard decor and nondescript tables and chairs have made way for brand new soft furnishings and a super stylish atmosphere that makes you feel right at home. Despite being set in a 400 year old listed building, the Red Lion’s makeover has catapulted it into the 21st century. We made good use of the Gin Infusion station that had been laid out to demonstrate the pub’s brand new gin menu. 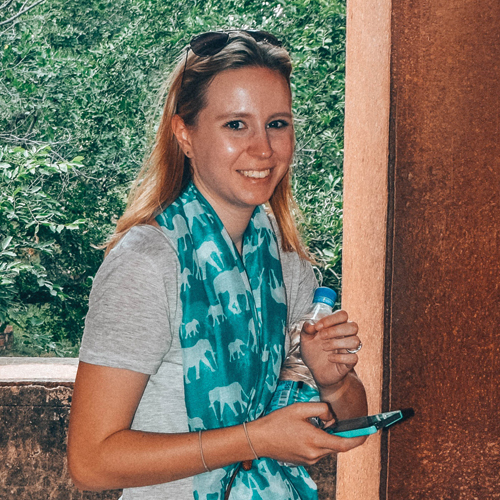 I happily sipped on a gin and tonic flavoured with rum-infused mango and watermelon, while others around me chose between more traditional flavours of lemon and rosemary and the more radical options of rose petals and flavoured liquors. 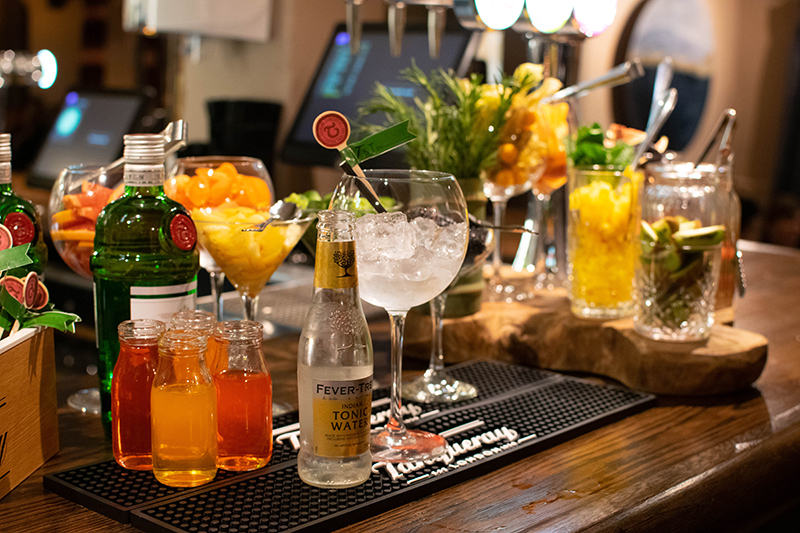 For those that don’t like gin, the well-stocked bar has something for everyone, from an extensive wine list and beers on tap, to plenty of non-alcoholic cocktails and soft drinks too. 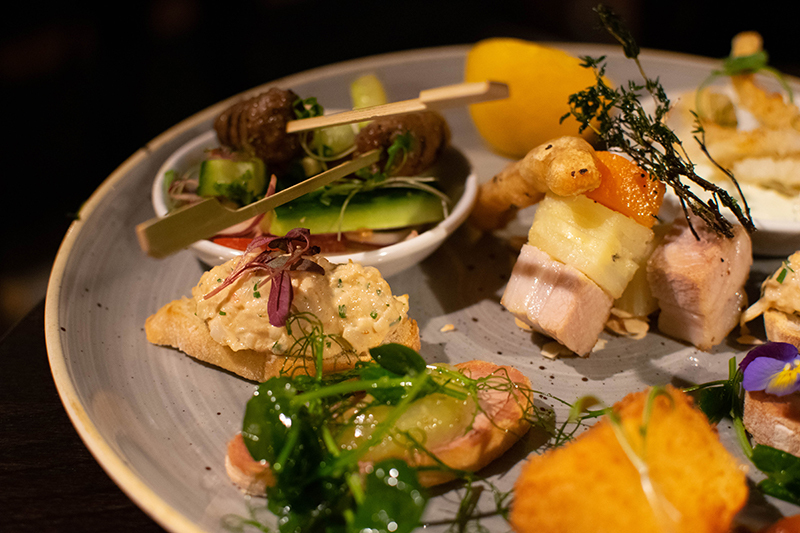 As part of the press event, we were served canapés made up of bitesize versions of the chef’s favourite dishes. 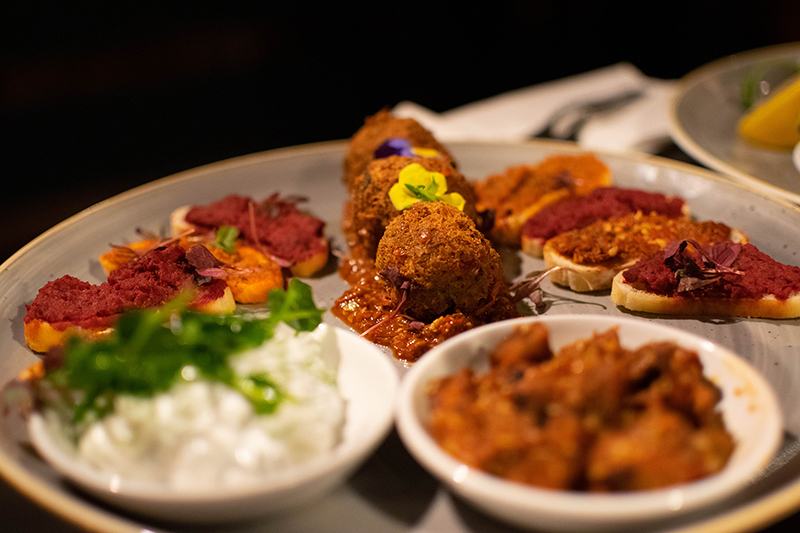 They were beautifully presented on platters, and while Tim enjoyed a plateful of pork belly, duck parfait, salt & Szechuan pepper squid, lamb kofta and deep-fried brie, I was more than happy with the vegetarian selection brought out especially for me. Being careful not to fill up before the meal even began, I tucked into crispy falafel served with beetroot hummus, coconut tzatziki, miso aubergine and tomato toasts. Then it was time to order our starters. 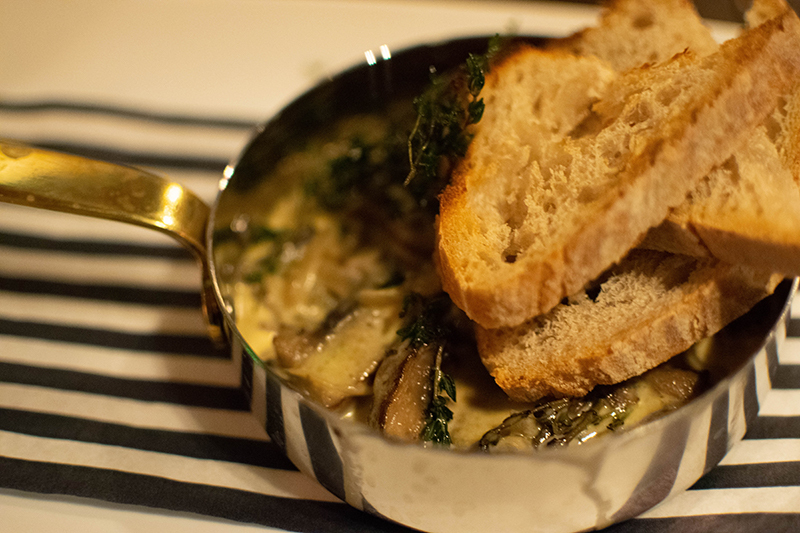 I chose the thyme-roasted portobello mushrooms, served in a stilton sauce with toasted bread. It’s a dish I had my eye on ever since I saw the menu, and it did not disappoint. I loved the creamy sauce, and the mushrooms were perfectly cooked with a delicate thyme flavour. Tim chose the scallops of the day, pan-fried with a crispy potato rosti and curried sauce. 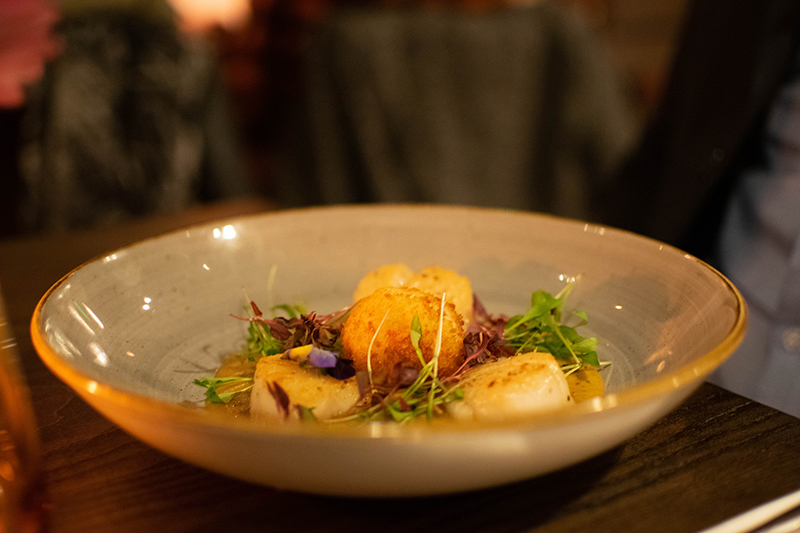 The dish prompted the biggest compliment of the night, “I don’t think I would order scallops ever again, as I’m scared they won’t be as good as these”. Moving on to the mains, I chose the roasted butternut squash & sweet potato tart, filled with roasted peppers, leeks, asparagus and tomato and topped with a Cropwell Bishop custard and stilton & walnut crumb. It’s a dish I’ve eaten (and loved) before at The Warren, and it absolutely lived up to my high expectations here. 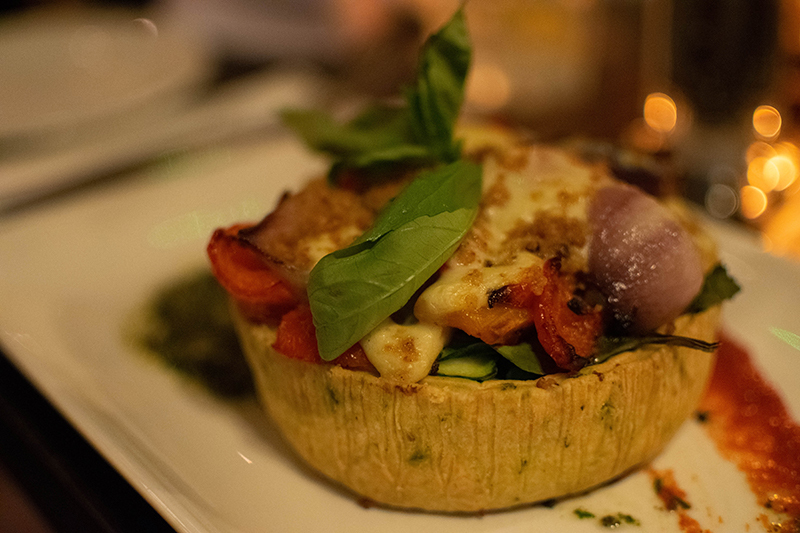 The pastry was wonderfully crumbly, and the fresh vegetables perfectly contrasted the rich sauce it was served with. Tim opted for the Carne Platter from the sharing starters as his main course. It consisted of a buttermilk chicken katsu, lamb koftas, crispy sweet chilli beef, salad and flatbread, and he was really impressed with it all. 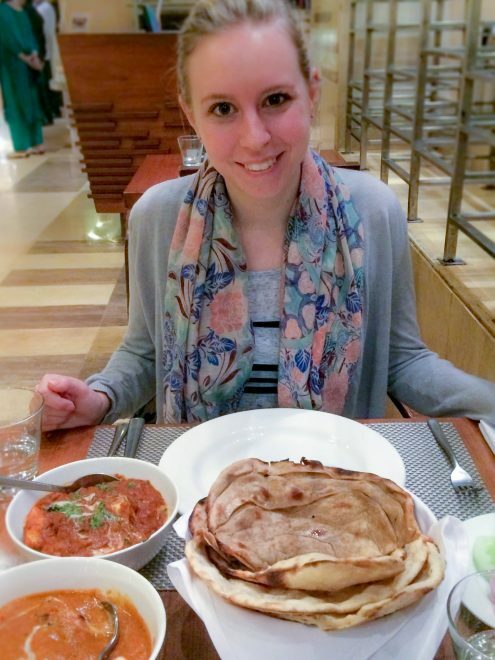 Our only complaint was that the portions were too big, and we felt guilty about sending so much back to the kitchen. You definitely won’t go hungry here! Finally, dessert. 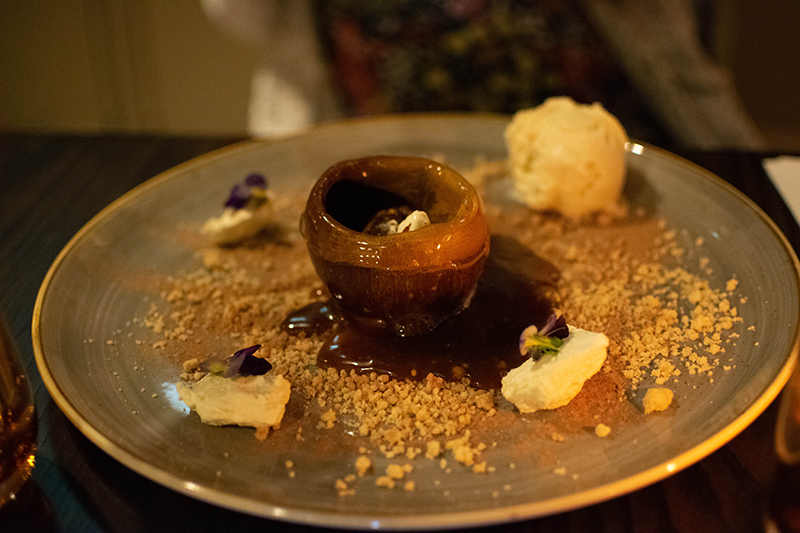 Admitting defeat, Tim opted for two scoops of chocolate ice cream, while I chose the pub’s ‘show-stopping’ dessert – the melting chocolate and peanut bomb, filled with sticky toffee pudding and peanut butter cream, served with Bourbon vanilla ice cream and a hot salted caramel sauce. What a mouthful – pun definitely intended! Sadly, this was the one disappointment when it came to the food. I enjoyed the theatre of the dish as the hot caramel sauce slowly melted away the chocolate sphere to reveal the pudding underneath, but the sticky toffee pudding inside was quite small and much drier than most sticky toffee puddings I have eaten in the past. I’m glad I’ve tried it, but don’t think I’d be ordering it again. 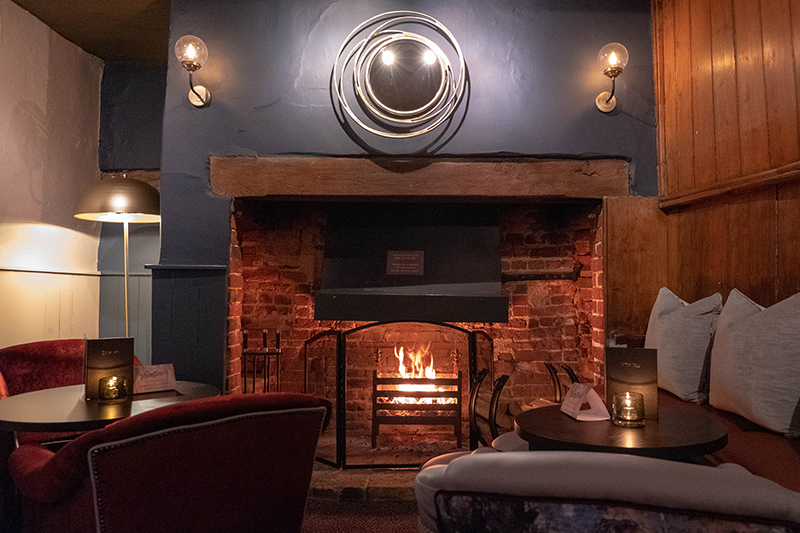 Overall, we thoroughly enjoyed our evening – the team at the Red Lion can be very proud of their new look and the food and drink certainly lives up to its new modern, stylish decor. When we find ourselves back in Stoke Poges, we know exactly where we’re going to be eating. 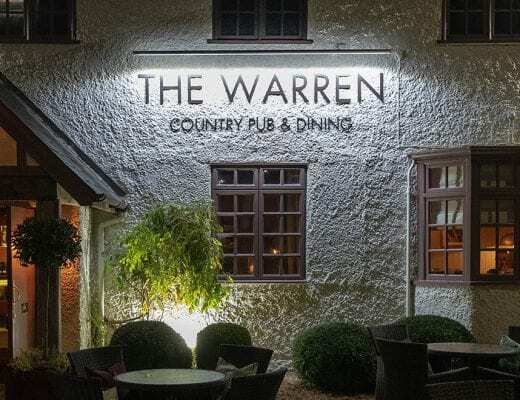 Disclaimer: Our meal at The Red Lion in Stoke Poges was gifted in return for this review, but the opinions stated in this blog post are completely my own.